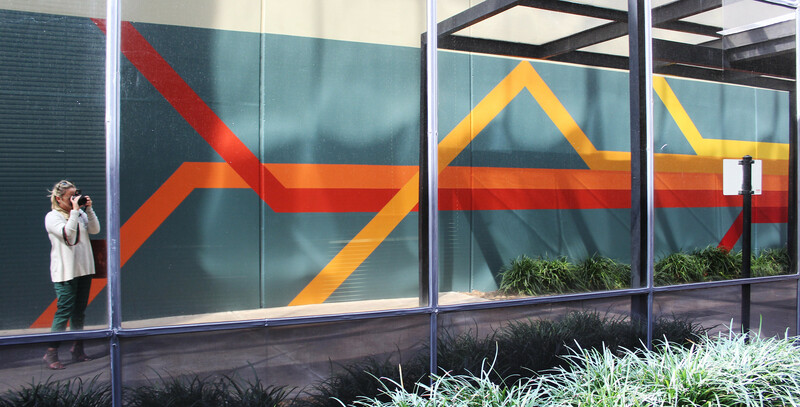 10333 Harwin Drive, an office building in Southwest Houston, has really been brought to life with a recent art installation that is surprising and fun. 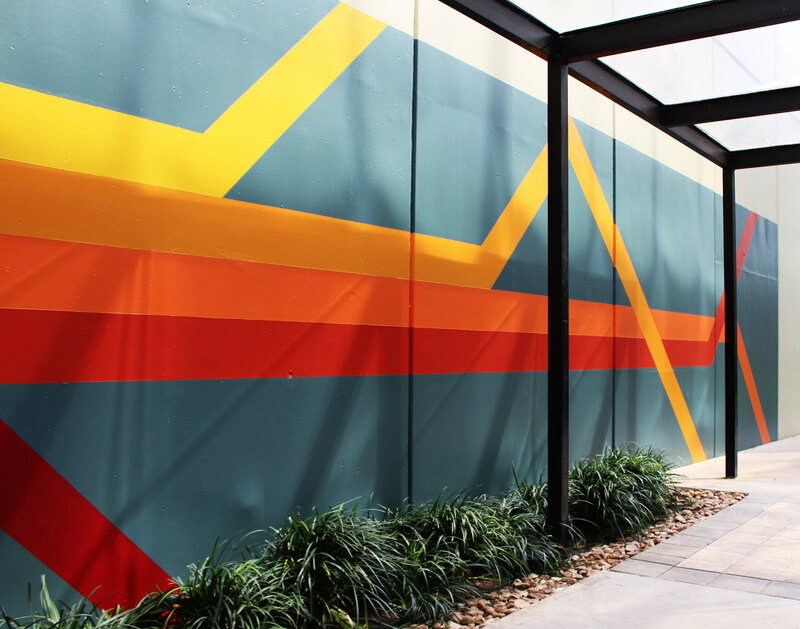 Boxer’s philosophy toward updating office buildings and bringing life to office space in Southwest Houston means incorporating art and life to a space. We sat down with Kaitlyn Satterfield, a Junior Designer, at Boxer Property to talk us about the art and get the details on the vision and how this vibrant artwork came to life. During a tour of 10333 Harwin, Andrew (Segal), our CEO was looking out the exit that leads to the parking garage and he said that he’d really like something impactful to be placed along this pathway to overcome this big gray wall leading into the building. Kaitlyn Satterfield was assigned the project. What was the vision behind the art at 10333 Harwin? We started thinking about ways to incorporate art into this area and began looking at sculptures, or other tactics to address the need to draw people into the building. We priced out a few options and the wall mural w/ paint was the best and most cost effective solution. We thought about the process to apply the paint, whether we should create multiple layers and textures, and the sophistication of the design that we’d apply here. We had to consider the budget and who would be doing the art install which attributed to our need for a simple, cost effective, design to implement but still conveyed the feeling & impact we wanted. While working on the design, we considered the audience; our customers definitely helped direct the design. 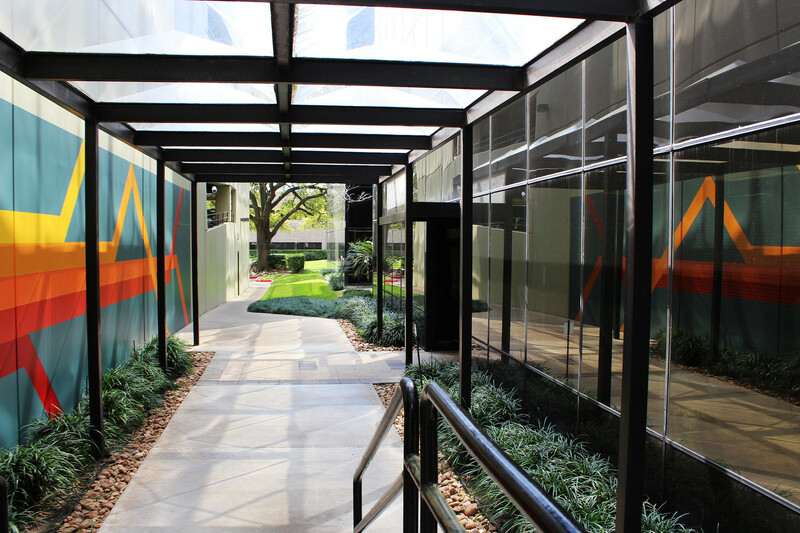 Located in the area near the famous Harwin Shopping District, this Houston office building is full of colorful fun people. The variety of businesses we had in the building took us in a few directions and helped guide us to the color choices and style of art we chose. The walkway between the parking garage and the building entrance is a very active space that everyone passes multiple times of day. We thought about people moving in and out of the building and the flow and that’s what we depicted in the art design that we created. The colors are bright and vibrant, they are warm and welcoming and really work well in the space. This is the first phase of bringing energy and color into the building. We will be bringing these colors in and onto the elevator lobbies and they’ll progress up all of the floors. How long did it take from planning the design to fruition of where we are today? A little laugh escapes Kaitlyn’s mouth as she thinks about the timeline. It took approximately 2 months to plan, design and define the outcome. To actually get it onto the wall took approximately a year and a half. This was for various reasons, from going through approvals, getting funding, the building was refinanced, and then finally engineering got the project moving along with a new property manager that was assigned the property. He was really excited about bringing more life into the building, so he really pushed to give the project momentum. Pricing was handled by Mathew Foster, Construction Manager. The Property Manager, Robert Mann, got the project moving. Once it was officially green-lighted our in-house paint crew got into action with Paint supervisor (Leo) Junior Hernandez, and painters Orel Nevarez and Orlando Lopez. What is your philosophy around art? “I’m a big believer in artwork for everyone, public art that everyone can see,” said Satterfield. “Public art is a really underutilized feature” for a lot of our properties. And having a really large piece of public art is really helpful to bring energy and life into our properties, it encourages the social aspect of office buildings. This piece welcomes people in, guiding people into the building. It’s not just a gray wall now, it’s multi-colors that adds movement and draws visitors in. What is Boxer’s Philosophy around art? Kaitlyn has at least 2 future projects with similar applications of large mural art. Stay tuned for more exciting art from our Space Planning & Design team.